The ‘February Revolution’, you may have noticed, took place in March. This is because at the time, Russia still followed the older Julian calendar, which was 13 days behind the Gregorian method used in western Europe. Protests began on International Women’s Day, 8 March 1917 (23 February in Russia), when women marched to protest at the poor conditions as a result of the war effort. At the time, Imperial Russia was at war with Germany and Austria-Hungary, fighting on the side of the British, French and Italian allies in the First World War. However, the war effort was having a huge effect back at home. Russia, which had been unprepared for the outbreak of hostilities, was struggling not only militarily but also economically as it adjusted to the demands of modern warfare. And women bore much of the brunt of the suffering. Not only were they worried about the fate of millions of husbands and sons at the front, they faced desperate economic conditions in their day-to-day lives. So when women textile workers from the industrial Vyborg district in Petrograd (St Petersburg), sick of working hard all day to earn money to queue for bread that was often in short supply, decided to strike, they quickly found support. Police tried to stop them crossing the bridges to the city centre – St Petersburg city centre sits on an island at the mouth of the Neva River – but many simply took to the ice of the frozen winter river to get to the other side. The upheaval quickly spread across the city and country. Trust and confidence in the Tsar and the royal family had been eroded, not only by the difficulties of the war effort, but by decades of brutality and the slow pace of development. The government and civil authorities, sensing trouble, were brought to their knees. Police reports from the time suggest confusion, with decisions descending into panic. The reaction of the authorities, far from quelling the protests, simply piqued public anger, drawing more and more people into the streets over the next few days. Chants, banners and protests increased, with demands now including an end to the war. Students, teachers, army deserters, and white-collar workers joined the crowds. The Russian Duma (government), already divided, began infighting, and turned on the tsar. 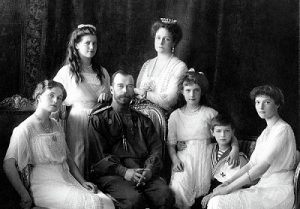 Just a week after the protests began, on 15 March (2 March according to the old calendar), Tsar Nicholas II abdicated the throne, bringing an end to 300 years of rule by the Romanov family. The end of the Russian Empire, of course, was not the end of the story. What followed were months of continued unrest, competing provisional governments with different political aims, and no end to Russian involvement in the war. The period was brought to an end when the Bolsheviks took control following the October socialist revolution later the same year. So, if you are attending an International Women’s Day event today, who knows? Perhaps your actions will be talked about in 100 years’ time as the spark that helped light the touchpaper of history.